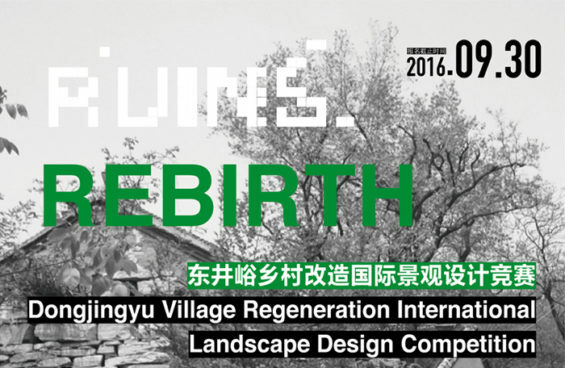 The “RUINS·REBIRTH” Dongjingyu Village Regeneration International Landscape Design Competition co-organized by China Building Centre (CBC), Yuyang Township Government and Tianjin Urban Planning and Design Institute. As a point of departure for Dongjingyu Village’s regeneration masterplan, this competition seeks to respond to the rural revival movement across China and explore the local culture and charm of the Village. Professionals in landscape, planning, architecture and art as well as individuals of cross-disciplinary thinking from all parts of the world are invited to delve into the rustic wisdom and human relationship with nature embodied in the place. The Dongjing Valley Village is at the Ji County, the only mountainous area in the Tianjin municipality and an hour’s drive from Beijing Capital International Airport .It is home to a cluster of vernacular stone dwellings of extraordinary design and layout, interspersed among grotesque rocks, primeval trees and rare plants. Not only is the village acclaimed for its primordial landscape and the stunning beauty of nature, It marks the beginning of the stratotype section of the Middle and Upper proterozoic Erathem some 800 to 1800 million years ago, a virtual topographical chronicle for us to minutely pore over. The Dongjingyu Village boasts locational advantages and idiosyncratic landscape. As habitat for a traditional Chinese rural community, it witnessed farmers’ simple way of making a living from the land. Decades of abandonment further turned it into captivating ruins and now, it seems to make perfect sense to reclaim this unique place through the power of design. design and art are invited. This is a fair competition to all the design companies, individual designers and students in architecture, landscape,urban planning, design and art. around the world. Winners will be announced in Nov, 2016. 2nd Prize (2 teams): Certificate and 50,000 CNY.before tax.